In earlier post, I’m writing “How to build openSUSE LiveUSB with Kiwi” tutorial guide and thinking how to get same results with more easier tips. Another distro came with easy trick to make a bootable LiveUSB and I think openSUSE should be 😉 . 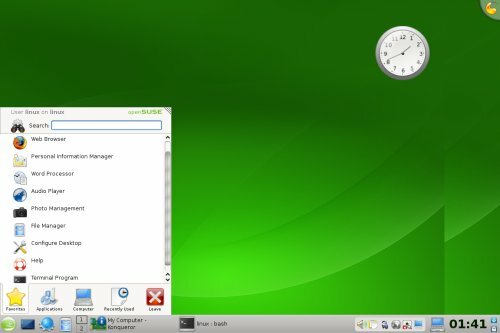 Kiwi is a great tools for making openSUSE liveUSB, QEMU Image, VMWare Image, XEN Image and LiveCD Image but it would not fit with any situation. With only like three weeks until openSUSE 11.0 is released to the world, now would be a good time to start the buzz around it. OK, so there’s already been a lot of buzz around 11.0, for example this article from Ars Technica which reached the front page of Digg, not to mention our own countdown and openSUSE 11.0 pages. But there’s many more ways you and I can help people know about openSUSE 11.0. If your into the whole Web 2.0/Internet/Social Networking thing, you know how much of a help and marketing tool (aka timewaster) it can be. The trick is to not bother people and throw openSUSE in their face every day (sorry Twitter friends!). But there are many ways you can use these tools to help openSUSE. Our own community manager Zonker has talked about using Twitter to spread openSUSE, and it does work. In terms of Twitter, however, it depends on who your followers are. For example, many of my followers are Linux or SUSE users already. How does Twitter help with those people? I’ll answer that in a minute. A few days ago, I started an event on Facebook: openSUSE 11.0 Public Release (you need to be logged into Facebook to view) as a type of meta-event. It doesn’t have a specific real world location (the location is set to opensuse.org; the city, which is required, was set to Nuremberg, Germany for obvious reasons) but it serves to bring the awareness of openSUSE 11.0’s release, and also encourages anyone else starting an actual release event (such as a openSUSE User Group or Linux user group) to add their event to Facebook and link it from the above event. Within 3 days, the number of people confirming their “attendance” is growing, and at least one person has mentioned that she plans on hosting a release party. So, do you have any other ways to help share openSUSE 11.0? Are there openSUSE groups or 11.0 release events on other social networking websites the community should know about? Let me know through the comments! Oh, and openSUSE 11.0 Release Candidate 1 should be out today! BTW, this is my first post. I’m Kevin Dupuy, and instead of rehashing it all here, I’ve got my bio up on the wiki here. I’ll be in Berlin on Thursday and Friday. As this is my first LinuxTag i’m really excited and looking forward to meet as many people from the “openSUSE universe” as I can find 😀 . See you at the openSUSE booth! Martin Lasarsch looks quite busy with his project, preparing openSUSE booth on Linux Tag at Berlin 😉 , and so do with us here in Indonesia, preparing openSUSE booth for IGOS Summit 2 event. IGOS stand for Indonesia goes Open Source and IGOS Summit 2 dedicated for open source promo and community building. Last week, Indonesian openSUSE community (openSUSE-ID) had a regular monthly meeting on Saturday, May 24, 2008. for promotional and marketing benefit, we choose Detik.com-currently biggest online newspaper in Indonesia) office at Aldevco Octagon Building Jakarta as our location for meeting. This is our sixth regular meeting since November 2007. Today (Saturday, May 24, 2008), Indonesian openSUSE Community (openSUSE-ID) have a regular monthly meeting. Meeting for this month will be held on detik.com office, Jakarta. We got about 30-40 registered members will be attending the meeting. It would reach more than 30 members because some of our regular meeting members didn’t submit their registration. The registration process itself only counted how much the attendees for better meeting room preparation. This month, the agenda of meeting will cover up some discussion topics : openSUSE 11.0 features and highlight preview, presentation about zypper package manager, openSUSE on USB Live Stick demo, preparation for IGOS Summit 2 event (The event looks similar with FOSDEM in Europe. 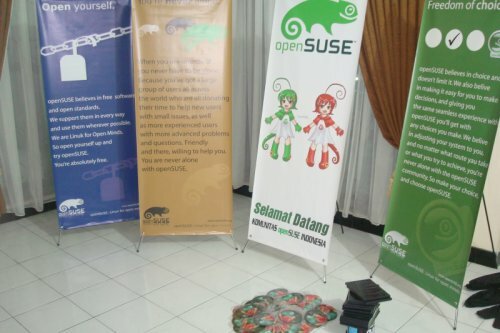 We have openSUSE booth at the event) and openSUSE 11.0 release party. I’ll be update with some picts of our monthly meeting. Yet again the guardians of the garden are boogieing. The GNOME Team are holding their meeting tomorrow Thursday 22nd May at 1600GMT/UTC/ZULU (or translate it into your local time). As always you can get sight of the agenda; the main themes for this week are Factory Testing, Bugs – under prioritised/bug voting/10.3 bug squashing, and a new item to the show Community Clinic. “What pray tell is that last item?” I hear you ask (you did ask didn’t you?). It is an item aimed at the code contributing challenged. Basically we hope to be able to provide means for those that are unable to hack (for whatever reason) a way of helping out. This could be packaging, documentation, pimping our wares and even HALO insertions behind enemy lines for guerrilla hit and run attacks. Okay maybe not the last item but you get the idea. Collaboration is not always an easy thing: Talking, meetings, making decisions and finding compromises. Sometimes I have the impression that some people in our business find this inter personal activities very exhausting and thus prefer to work on their own. Depending on how genius one is that works far. But for obvious reasons working alone has limits. If we talk about a whole Linux distribution for example one can not succeed: The working power, creativity and time of one is not enough. That is one reason why we consider it as one of the keys for success that the Build Service enables people to work together in a useful and non annoying way. We think of tools in the Build Service which help. That is difficult because some formalism and guidance (in business often called ‘process’) is needed to keep things going in a transparent and reproduceable way. Control should stay there where it needs to be, for example at the maintainer of a project. On the other hand collaboration tools should not constrict people and their working together. Karl, a developer working for a small software company, loves openSUSE but not really the one package Kabax because there is a packaging problem Karl has analyzed. Karl wants to change that to make sure that the next version of openSUSE contains a good version of Kabax. For that, a branch of Kabax in Factory is needed where the fixes can be put in, built and tested. Karl uses osc to create a branch. The package is not really maintained in Factory itself, because the few Factory maintainers can not care about all packages there. Kabax has a Devel Project entry in its meta data that points to the project where it is actually maintained by the expert Karsten. Because of the devel project, osc branches not really from the Factory package but from the development project where the development happens by Karsten. That might be different from the Factory package, but is clearly the development version that soon will be synced to Factory. When that happens is up to Karsten and the maintainers of Factory. In the branch Karl starts to work on Kabax and creates a beautiful patch. Since his branch package also lives on the Build Service, it builds live for all relevant repos and along the changes of the devel project. Once Karl is happy with his work he raises the attention of Karsten on his change by creating a submit request. A request in general informs others of something somebody else has done which requires action. In the case of the submit request it tells Karsten that there is a valuable change to his package that should make it’s way to Factory. Karsten now accepts the request and Karls contribution is in. The nice thing about all this is also that the branch packages as well as the requests are open and visible to everybody who is interested in. That gives us the transparency we need. And of course that does not only work for Factory but for all projects if one wants to change something on a package where he/she does not have permissions yet.